I didn’t consider myself a Lubavitcher, but I lived in Crown Heights for a short time after I got married. I would attend the Rebbe’s farbrengens from time to time, but my relationship was always from a distance. I mention this because of what happened later on. Three years after we married, my wife and I moved away to Silver Spring, Maryland, where I attended the University of Maryland. I received a PhD in psychology and began working as a psychologist in the local school system. Besides this, I used to give classes in Talmud—one on Shabbos afternoon for the general public, and one on Tuesday night for a smaller group who wanted to learn on a deeper level. Should I stay in Torah learning, or should I continue in psychology? And if so, how should I further my career? Should I move into private psychotherapy work or accept an offer from one of the county social service organizations in the area? Also, I wasn’t sure what was best for my children in terms of educational options in Silver Spring. In addition to all these dilemmas, like everybody else I guess, I had my own questions of faith and trust in G‑d, as well as some philosophical questions. I was in a state of uncertainty. I had my own questions of faith and trust in G‑d . . . I was in a state of uncertainty. All these questions had me depressed, and I was unsure what to do or where to go. I spoke to various close friends, and one of them—a Chabad chassid—suggested that I visit the Rebbe. And so it was that in February of 1971 I called the Rebbe. I replied, “A yid fun Maryland” (“A Jew from Maryland”). I told the secretary that I have many questions which I would like to discuss with the Rebbe—questions about what direction my life should take, questions regarding my career, questions of faith… I explained that I was at a very uncertain stage in my life and I didn’t know where to turn. I spoke in English and, as I was talking, the Rebbe’s secretary was repeating and paraphrasing my words in Yiddish—I imagine he was doing this so that the Rebbe should hear. Now, I couldn’t believe my ears. I knew for sure I had not given the secretary my name, but the Rebbe had just said my name! I was taken aback, and I wanted to hear it again. So when the secretary asked whether I heard, I said no. I thanked him very much, and the call ended with that. And from that point on, I became much more decisive. I think up to that time I had a tendency to be very ambivalent. I was not a risk-taker; I was a procrastinator when it came to making decisions. But from that point on, I became decisive. That the Rebbe understood that, I think, was part of his great wisdom. The Rebbe could have picked up the phone and told me what to do, but I wouldn’t necessarily have listened to what he told me, and I wouldn’t have accepted it in the same way I accepted this. Like many people, I suppose I had a natural resistance to being told by others what to do, and I think the Rebbe had insight to know that it was better if I heard the answer from myself than if I heard the answer from him. A few months after that life-changing phone call, there came an opportunity to express my gratitude to the Rebbe in person.I had come to visit my in-laws in Brooklyn, and my father-in-law encouraged me to go to the Rebbe to thank him. The Rebbe was blessing people in a small public audience, and I went over to him and said, “My name is Weinreb and I’m from Maryland.” And he gave me a big smile of recognition. I saw the Rebbe many times, and I saw many pictures of him, but that particular smile meant a lot for me. I left Silver Spring, and eventually I made a career change from being a full-time psychologist to becoming a rabbi of a synagogue. For many years I was the rabbi of Shomrei Emunah, a wonderful congregation in Baltimore. Later in life, I was offered to take over as the executive vice president of the Orthodox Union, a position I accepted, though it was a difficult decision to leave my Baltimore post. Since 1971, there have been times when I faced difficult questions in life, and before I sought advice from anyone else, I would listen to my inner voice. I would set aside time to first study some of the Rebbe’s teachings—like Likkutei Sichot—in order to connect again, and then I’d follow the advice he gave me: to talk to myself. And I’ve encouraged other people to do the same. Before you go asking this and that of another person, first talk to yourself and listen to what you have to say about it—sometimes your own advice is the best advice. In loving memory of Shmuel Nota Hakohen Ben Yibodel Lechaim Tovim Yisroel Dovid. 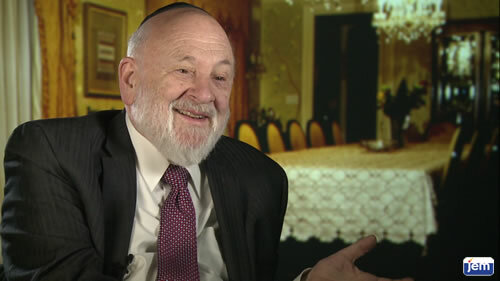 Rabbi Dr. Tzvi Hersh Weinreb is an ordained rabbi, a qualified psychotherapist and the Executive Vice President Emeritus of the Orthodox Union, a position he has held since 2002. 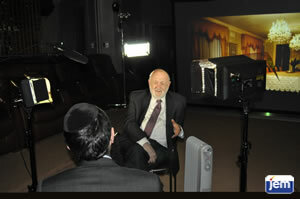 He was recently interviewed in the My Encounter studio in New York in May, 2013. Non-Jew Going through job and career dilemmas. I have meditated and repeated Psalm 23 more times in the last 36 hours than I have in the last decade. Very timely encouragement. Thank you for this ........ I believe that there is no such thing as a coincidence. I do believe in what seems to be synergy, that is, Hashem's place within us that leads us to what we need when we need it. We just need to recognize it. Naive? Maybe. Reading this piece is what I need right now. Dr. Weinrab's experience happens more often than not. I suspect that we continue to have doubts throughout life. And, although I'm celebrating my 78th birthday this week & am much more comfortable with decision-making, I sometimes feel like a child who could use a little guidance. This is my last week at a job I've held for almost 12 years. I have mixed feelings about leaving. I don't look at it as 'retirement,' but as a 'sabbatical!' I do intend to 'look within' to see what's really there and to sort out all of the possibilities. That Inner Voice As a child I was frightened by the Walt Disney film about Pinocchio and the inner conscience of Jimmy Cricket. I still don't know why. But my inner voice became very well developed and when I compare it to that of others I sometimes wonder where I got my strong sense of ethics and moral values. As a psychiatrist, Rabbi Tzvi Hersh Weinreb can surely recognize the two concepts of ego and super-ego here as the selfish inclination and its moderating conscience. So I find it rather strange that there was such a problem in his mid-life, and I am glad that it was solved. Here's My Story is part of JEM's My Encounter with the Rebbe oral history project, dedicated to documenting the life of the Rebbe, Rabbi Menachem M. Schneerson, of righteous memory.